This is the final piece of a three-part series on the history and current updates of the Houston Zoo Reflection Pool. 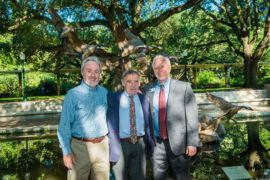 On Wednesday, May 24, the Houston Zoo held a dedication ceremony to honor the generous gift from the Marvy Finger Family Foundation, honoring Jerry and Ronny Finger. 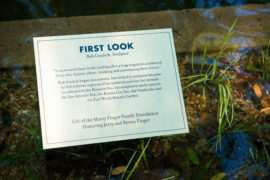 About 60 guests were in attendance, including close family members, zoo board members, and friends, including John and Jessie Killian, the couple who introduced the artist, Bob Guelich, to Marvy Finger. The sculpture was commissioned in 1979 for a building Finger owned at the time. About three years later, the artwork, which features a flock of 10 Canada geese flying through the air, was complete. “I envisioned these birds landing after a long migration southward from who-knows-where, honking and announcing their arrival,” said Guelich. More than 30 years later, the sculpture was reconditioned and plans were set to bring it to the zoo. Standing at an impressive 18 feet long and 13 feet tall, this bronze sculpture weighs 8,500 pounds! It’s so massive that the zoo maintenance team had to use a large crane to get the sculpture to its current location in the Reflection Pool. In an extraordinary act of generosity, Finger donated this sculpture for all to enjoy—now, and for generations to come. “It’s just overwhelming to me,” said Finger of his excitement that the sculpture would live at the zoo. 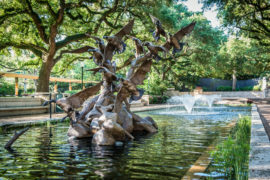 During your next visit to the zoo, head over to the Reflection Pool to see this magnificent work of art. It’ll make for a great photo!